86th Street is a major two-way street in the Upper East Side and Upper West Side of the New York City borough of Manhattan. It runs in two major sections: between East End and Fifth Avenues on the Upper East Side, and between Central Park West and Riverside Drive on the Upper West Side. The western segment feeds into the 86th Street transverse across Central Park, which connects to East 84th and 85th Streets on the eastern side. On the West Side its continuous cliff-wall of apartment blocks including The Belnord is broken by two contrasting landmarked churches at prominent corner sites, the Tuscan Renaissance Saints Paul and Andrew United Methodist Church at the corner of West End Avenue, and the rusticated brownstone Romanesque Revival West-Park Presbyterian Church at the corner of Amsterdam Avenue. The street was designated by the Commissioners' Plan of 1811 as one of 15 east-west streets that would be 100 feet (30 m) in width (while other streets were designated as 60 feet (18 m) in width). Until the years following World War II, Yorkville on the East Side was a predominantly German community, and East 86th Street was nicknamed the German Broadway. The early settlement originally clustered around the 86th Street stop of the New York and Harlem Railroad. Since the late 1980s, nearly all distinctly German shops have disappeared, apart from a few restaurants on Second Avenue. The street was commonly considered a boundary for public utilities. For example, different telephone exchanges at East 79th and 97th Streets served the north and south sides of the street. Local number portability in the early 21st century allowed transferring phone numbers to either side. A sunken street through Central Park, the 86th Street transverse, connects West 86th Street with eastbound East 84th Street and westbound East 85th Street. Miners Gate provides pedestrian access to the park at East 86th, and Mariners Gate at West 85th. Before the subway opened on Lexington Avenue in 1917, a railroad station existed on Park Avenue, currently a right-of-way for the Metro North Railroad between 125th Street and Grand Central Terminal; it opened in May 1876 and closed in approximately 1903, and an emergency exit is the only vestige of the station's existence. The M86 Select Bus Service bus serves the street. Until the 1950s, the Second Avenue and Third Avenue elevated lines served 86th Street on the East Side. The New York and Harlem Railroad used to operate an 86th Street rail line which ran on the surface from Central Park West, through Central Park and on to York Avenue. The line then turned north and terminated at the Astoria Ferry landing at 92nd Street. The Metro-North Railroad has an abandoned underground station at 86th Street and Park Avenue. Renee Fleming – opera "diva"
^ Google (January 8, 2017). "86th Street" (Map). Google Maps. Google. Retrieved January 8, 2017. ^ Strausbaugh, John (December 14, 2007). "In the Mansion Land of the 'Fifth Avenoodles'". The New York Times. Retrieved March 3, 2012. ^ Manhattan, NY 10028 (January 1, 1970). "10028 – Google Maps". Maps.google.com. Retrieved October 26, 2011. ^ Meyers, Stephen L. (2005). Manhattan's Lost Streetcars. Arcadia Publishing. p. 97. ^ "Paula Barbieri Address and Pictures". Celebritiesfans.com. Archived from the original on February 8, 2012. Retrieved October 26, 2011. ^ "Will Elaine's East 86th St. Penthouse Really Get $1,500/sf? – Upper East Side Real Estate – jlanyard". Newyork.nearsay.com. Retrieved October 26, 2011. ^ Barbanel, Josh (July 10, 2010). "Limbaugh Gets Mega Millions on Condo Sale - WSJ.com". Online.wsj.com. Retrieved October 26, 2011. ^ Sanders, Sarabeth (November 19, 2010). "Hedge funder John Paulson picks up $3M Olympic Tower pad". Therealdeal.com. Retrieved June 5, 2014. ^ Myers, Marc (January 31, 2013). "Replay: Joe Namath's Bachelor Pad". online.wsj.com. Retrieved October 29, 2014. 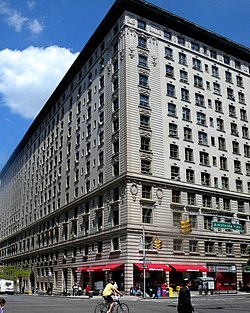 ^ "7 West 46th Street, Part 2: Diamond Jim Brady/Lillian Russell Love Nest?". Gotham.fromthesquare.org. August 16, 2009. Retrieved October 26, 2011. ^ "Direcciones de famosos c Busca biografías Miles de biografias". Buscabiografias.com. Archived from the original on September 27, 2011. Retrieved October 26, 2011. ^ The Celebrity Black Book 2008: Over ... – Jordan McAuley – Google Books. Books.google.com. Retrieved October 26, 2011. ^ a b Hall, Mitchell J. (June 5, 2014). "Manhattan Real Estate in history: Tom Cruise circa 1981". ActiveRain. Archived from the original on June 6, 2014. Retrieved June 5, 2014. ^ Gordon Polatnick. "Stabbing Page in Fuller Up, Dead Musician Directory". Elvispelvis.com. Retrieved October 26, 2011. ^ "For Art DLugoff, at heavens gate". Thevillager.com. Retrieved June 5, 2014. ^ Sanders, Sarabeth (March 24, 2010). "Spotted: Matt Damon cruising premier UWS addresses | The Real Deal | New York Real Estate News". The Real Deal. Retrieved October 26, 2011. ^ a b "New York StarWalks". Yanko.lib.ru. Retrieved October 26, 2011. ^ "Diva Renee Fleming pays $4,262,700 for Upper West Side penthouse". Bergproperties.com. Retrieved October 26, 2011. ^ Turnbull, Giles (April 13, 2010). "Meeting Joe Franklin". The Morning News. Retrieved October 26, 2011. ^ a b "Upper West Sider Switches From Dribbling Balls To Tickling Ivories". DNAinfo.com. April 22, 2011. Archived from the original on January 16, 2012. Retrieved October 26, 2011. ^ "Elena Kagan's Upper West Side story – New York on the Potomac". Blog.timesunion.com. May 13, 2010. Retrieved October 26, 2011. ^ "TRP: Obituary: Amos Joel". Trp.trpc.com.hk. Archived from the original on March 28, 2012. Retrieved October 26, 2011. ^ "Favorite Son | Michael Gross". Mgross.com. Retrieved October 26, 2011. ^ "Grete Mosheim (1905-1986)". Passport Land. Archived from the original on April 18, 2012. Retrieved June 5, 2014. ^ "Comedian Zero Mostel at home on W 86th St w his wife Kate and son Tobe News Photo 50465890". Getty Images. December 1, 1964. Retrieved June 5, 2014. ^ "New York City Business News & Info". Newyork.nearsay.com. June 1, 2014. Retrieved June 5, 2014. ^ "NYC Real Estate & Neighborhood Guide". CityRealty. Retrieved June 5, 2014. ^ Calderone, Michael (August 1, 2005). "Mellon Townhouse Hits Market for $26.5 M.; Court TV's Jami Floyd Moves On Up to West Side for $1.3 M." The New York Observer. Retrieved January 19, 2013. ^ Polsky, Sara (June 29, 2011). "Isabella Rossellini Sells Upper West Side Penthouse Over Ask - Celebrity Real Estate - Curbed NY". Ny.curbed.com. Retrieved June 5, 2014. ^ Haute Living (August 3, 2007). "Diamonds are not Forever: Extell Development CEO Gary Barnett". Hauteliving.com. Retrieved June 5, 2014. ^ "CursumPerficio". CursumPerficio. Retrieved June 5, 2014.